Catherine Gaskin was born in Ireland but raised in a suburb of Sydney, Australia. She wrote her first novel This Other Eden (1945) at age 15, and got it published two years later. After spending several years in London, she married an American and lived for some time in New York City. 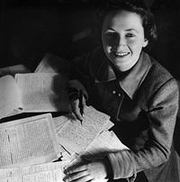 Gaskin's best known work was Sara Dane (1955), which concerns the life of an English girl sent to Australia as a convict who then successfully rebuilds her life. It sold more than 2 million copies, was translated into a number of other languages, and was made into a 1982 television miniseries. She and her husband went to live on St. Thomas in the Virgin Islands for two years before Gaskin moved to the Wicklow Hills of Ireland and took up Irish citizenship in 1967. She returned to Sydney, where she died in 2009. Catherine Gaskin is currently considered a "single author." If one or more works are by a distinct, homonymous authors, go ahead and split the author. Catherine Gaskin is composed of 9 names. You can examine and separate out names.